This gluten-free hamantaschen cookie recipe with almond flour is light and flaky with buttery flavor and satisfying crunch. Unlike most gluten-free baked goods the texture is more like pastry and not like cardboard. These will meet the craving when your loved one can’t have regular purim cookies on the holiday, and in my opinion, these taste better. We got a container of hamantaschen cookies from Israel last month in our Lev Haolam monthly parcel that supports Israeli businesses around Jerusalem and the West Bank. But Mr. Joybilee has a wheat allergy so he could not enjoy the cookies. I tasted one of them but honestly I’m not a fan. They were cardboard-y and had an off-flavor, like they had been cooked in hyrdrogenated soy oil. But since the ingredient list was in Hebrew, I couldn’t actually tell what the ingredients were. It was the second time I’ve had Israeli Hamantaschen and I’ve got to say, the ones I’ve had taste “off”. But in honor of the day (Purim) I thought I’d create a homemade version that uses gluten-free almond flour, plus a little lemon zest for flavor. 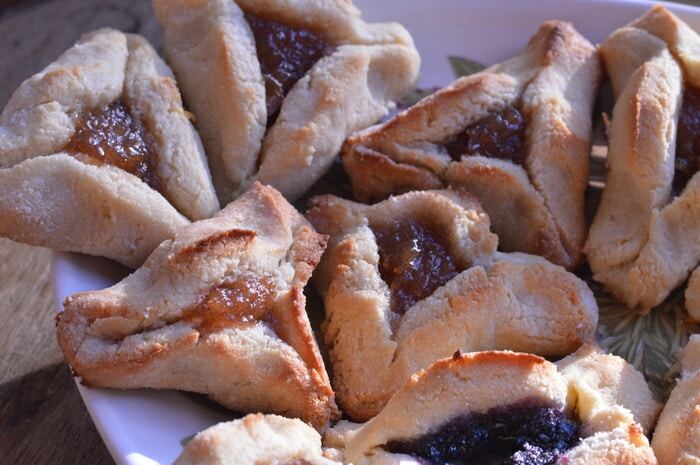 And what I discovered is a new version of hamantaschen that I like much better. In fact I like these even better than the gluten-free purim cookies I made last year. And my gluten-free man? He really likes them. And that, after all, is what counts. 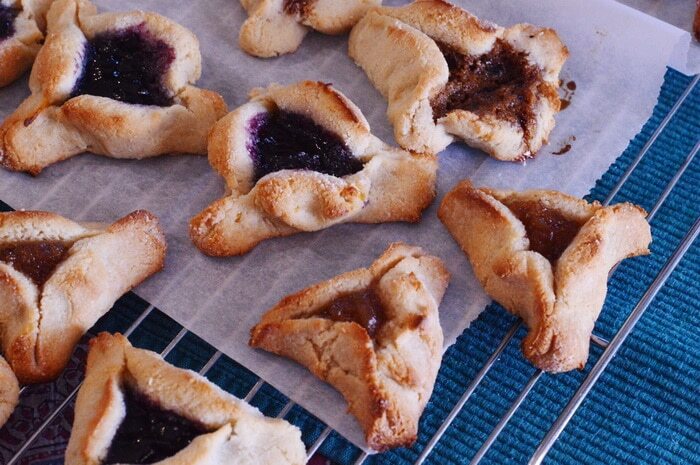 A hamantaschen is a filled-pocket cookie or pastry recognizable for its triangular shape, that is part of the Jewish holiday of Purim. The cookies point to Haman, the villain in the Purim story. The shape is achieved by folding in the sides of a circular piece of dough, with a filling placed in the center. 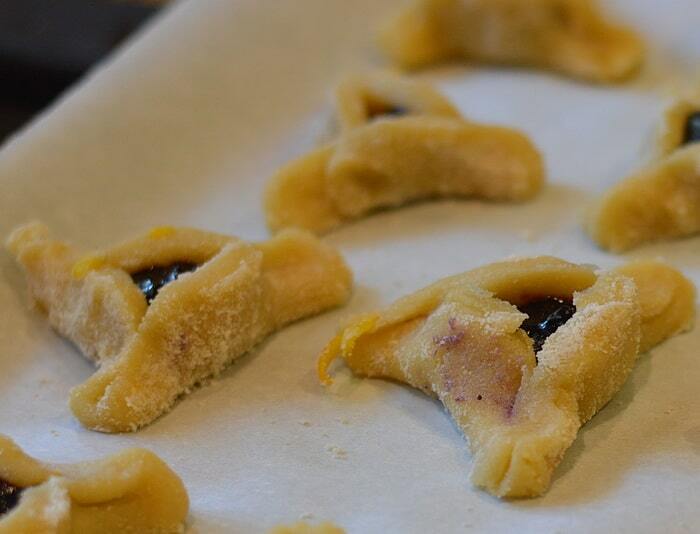 There are many kinds of filling used in these Purim cookies from fruit fillings, poppy seeds, chocolate, or date paste. This recipe uses jam for the filling. In place of the usual wheat based cookie this recipe uses almond flour which is naturally gluten free. How long will they take to make? 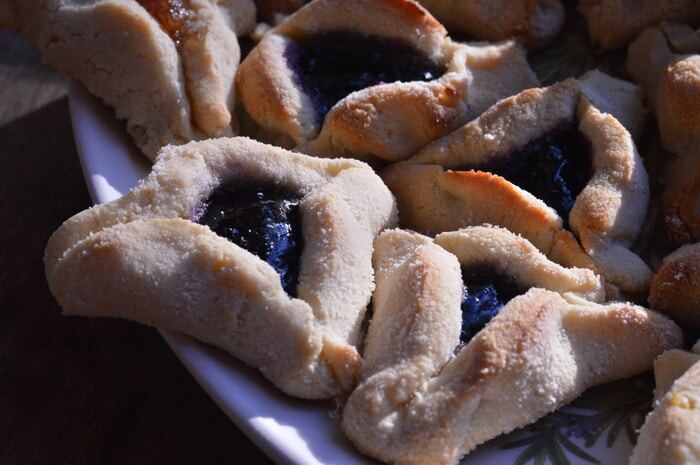 Set aside 75 minutes to make these gluten-free Purim cookies. 15 minutes to mix the initial dough and then about an hour to roll them out and bake them. If you have bottles of jam in the fridge that need to be used up, this is a good recipe to do that. I used 4 ounces of blueberry jam and 4 ounces of apple cinnamon conserve for 2 1/2 dozen cookies. The apple conserve was also from a Lev Haolam parcel last fall. And it is the perfect filling for this lighter version of gluten-free hamantaschen with almond flour. These are light and flaky with a fresh flavor that is an improvement on tradition. For a nondairy meal, butter can be substituted with additional olive oil, cup for cup, without changing the texture of the dough. Beat eggs until they are frothy. Add honey, olive oil, and butter. Beat together until thick. Add lemon zest, tapioca flour, baking soda, and almond flour. Mix together until a soft dough forms. You can not over mix this dough. Preheat oven to 360F. Prepare baking sheets by lining with parchment paper. Divide dough into four equal parts. Using additional almond flour, roll out each portion to 1/4 inch thick. Cut with a round cookie cutter or the rim of a glass. Remove dough scraps and return to the bowl. 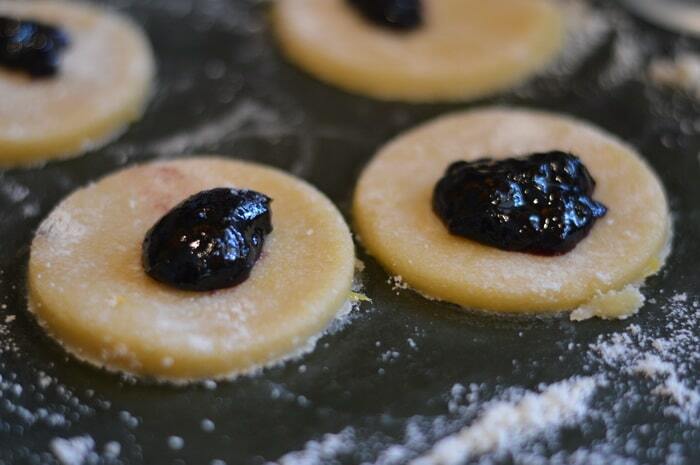 Working with one piece of cookie dough at a time, place 1 teaspoon of jam in the center of a round of cookie dough. Pinch the dough together on one side. The form a triangle by pinching two other corners together at angles to the first pinch. Place the completed cookie on the parchment lined baking sheet. Repeat with the remainder of the dough. Bake one baking sheet at a time in a 360F oven for 12 minutes, or until the cookies are golden brown and the center of the cookie is bubbling. Remove from oven. Slide the cookies, while still on the parchment paper onto a cooling wrack. Repeat with the remaining baking sheets until all the cookies are baked. Allow to cook for 30 minutes before serving. Celebrations with traditional foods are important in any culture. When one person misses out because of a food allergy. It makes it hard. Gluten-free hamantaschen is an attempt to bridge this gap so that every family member can enjoy the holidays without feeling left out. Lev Haolam is an Israeli membership that supports small family businesses and artisans inside Israel fight the discriminatory Israeli boycott, by giving them an international market for their products. Every month my family receives a small parcel from Israel with food, cosmetics, wine or oil, and artisan products. Most of the items are amazing. But some are made with wheat and those we pass along to other people or take to potlucks to share. There is also information inside the parcel that highlights an Israeli family business and tells us their story. Many of the stories are of resilience in the face of loss. Some of the businesses that have been highlighted in the last year include businesses that we actually visited in 2016 when we traveled to Israel during the Fall Feasts. You can learn more about Lev Haolam and their initiative here. (no affiliation). 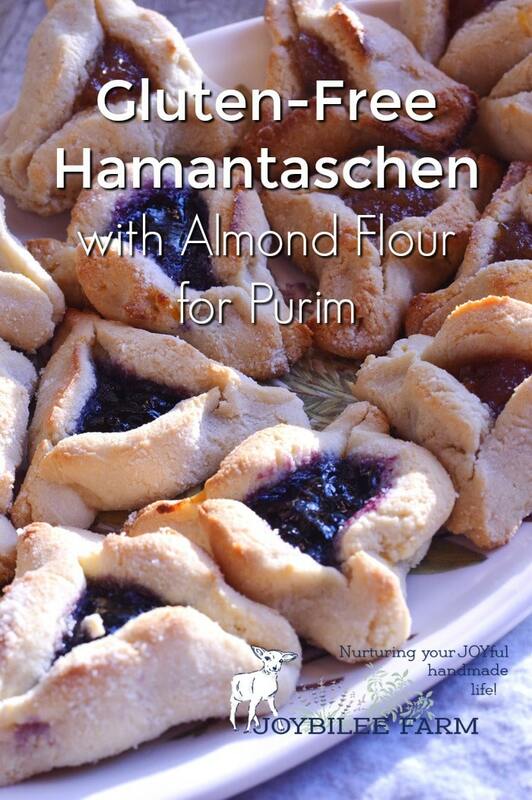 Are you ready to give these gluten-free Purim cookies with almond flour a try? Print out the recipe. Let me know if you like this lighter version, made with baking powder and almond flour, better than the easy gluten free hamantaschen. recipe. I think I might take these to a potluck, too. They are tasty enough to share with friends.